Interested in learning more about job opportunities throughout the biotech/pharmaceutical industry or in regulatory affairs? Want feedback on a job application? Looking to build your professional network to better your job prospects for the future? 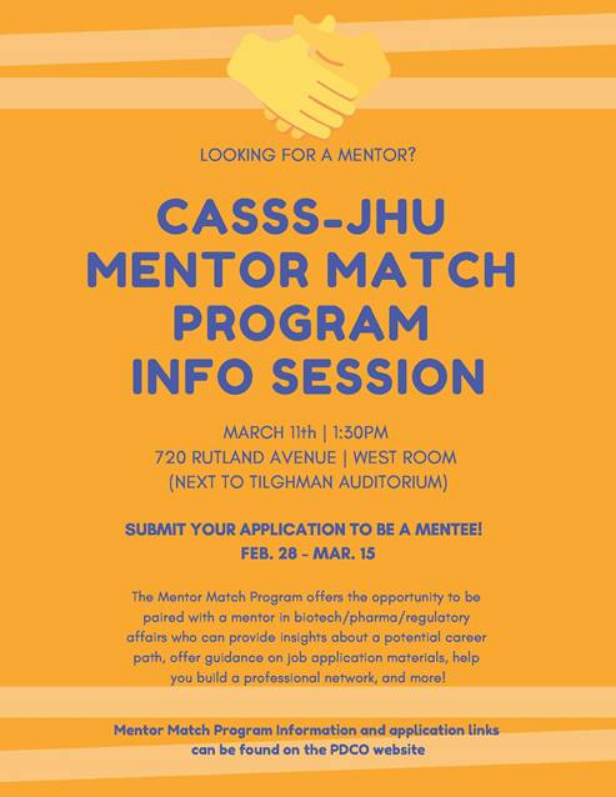 Apply for a spot in the CASSS-JHU Mentor Match Program! The CASSS-JHU Mentor Match Program offers a great opportunity to select a mentor from a group of professionals within the CASSS Organization, a community of industry, academic, and regulatory professionals. APPLY HERE! Applicants must be either a PhD student or a postdoctoral fellow at the School of Medicine, Bloomberg School of Public Health, Whiting School of Engineering, or Krieger School of Arts & Sciences. For those who are PhD students, priority will be given to those who are late-stage PhDs.